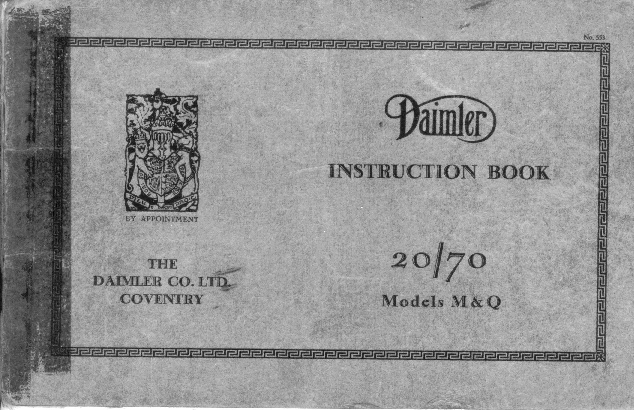 The Owner's Manual for the Daimler was with the car when we bought it. I have converted it to HTML and provided links to scans of the original pages. If you follow these links, you will need to use your browser's Back button to return to the HTML version. An index is provided to allow you to navigate to any subject mentioned. Note especially that the maintenance chart on page 1 is worked out assuming an average of 1000 miles per month. The expected mileage for a car on today's roads is an average of 1000 miles per month. The instructions on gear changing (page 6) tell you to start off in top gear. The detailed instructions on page 51 onwards tell you exactly how to change gear, starting with the change down - because, of course, you were already in top gear!